These days, there is a lot of talk about the “end of days.” Watching our world convulsing, seeing events destabilizing and growing more dangerous, many people, whether religiously minded or not, are paying more attention to all types of dire prophecies, including those involving blood moons and red heifers. Journalists and everyday people are actually wondering openly about supernatural signs, massive cataclysms and the end of the world. They are wondering if we are facing the events described in Bible prophecy. In recent decades, it seems that every few years someone comes along with a new prediction of the catastrophic end of the world as we know it. And then those predictions prove false. This problem of failed prophecy has plagued many religions for thousands of years. People predicting Jesus Christ’s return have set dates, then shifted the dates when those dates came and went. Some have subsequently adopted theories that Jesus Christ has returned secretly. But most have just grown uncomfortable with the entire subject of end-time prophecy, and they have pushed it far into the background. Though headlines about prophecy are circulating again, Bible prophecy is still widely considered a fringe subject. Doctrinally, different Christian groups hold very different views regarding the end of the world. The spectrum runs from vociferous street-corner preachers to scoffers whose views are virtually secular and who disbelieve altogether the return of Christ. 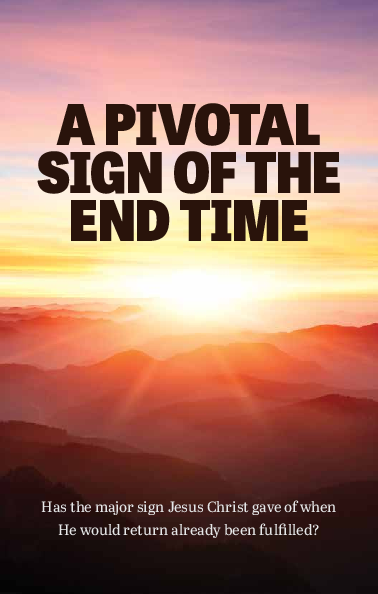 Bible bookstores stock numerous publications attempting to explain end-time prophecy, interpreting the mystery of various prophetic symbols, with one book contradicting the next. But prophecy is right there in the Bible. That’s where the phrase “time of the end” comes from. The Old Testament prophets prophesied. The New Testament apostles prophesied. Jesus Christ Himself prophesied. In fact, He explicitly prophesied about the end time and the end of the world. That is why people think of Bible prophecy when they see news reports about terrorism, religious clashes, trade wars, radical regimes and weapons of mass destruction. Jesus was a prophet. He prophesied throughout His ministry. Just before He was crucified, in His most crucial prophetic message, the “Olivet prophecy,” Jesus said, “And then shall appear the sign of the Son of man in heaven: and then shall all the tribes of the earth … see the Son of man coming in the clouds of heaven with power and great glory. … Now learn a parable of the fig tree; When his branch is yet tender, and putteth forth leaves, ye know that summer is nigh: So likewise ye, when ye shall see all these things, know that it is near, even at the doors” (Matthew 24:30, 32-33). In this same prophecy, Jesus made this crucial clarification: “But of that day and hour knoweth no man, no, not the angels of heaven, but my Father only” (verse 36). Be wary when you hear someone predicting a specific date of Christ’s return. But also be wary of anyone who tells you there is no way to know. Christ said plainly that we should be able to recognize signs “that it is near, even at the doors” (verse 33). God has not revealed the date, but He has revealed a number of signs. “And ye shall hear of wars and rumours of wars: see that ye be not troubled: for all these things must come to pass, but the end is not yet” (verse 6). Christ said that wars and rumors of wars would spread, but these of themselves were not signs of His return. He then said that “there shall be famines, and pestilences, and earthquakes, in divers places. All these are the beginning of sorrows” (verses 7-8). So when you see wars and rumors of wars increasing—and you see famines, pestilences and earthquakes increasing—do not pretend everything is normal. Sit up and take notice! Jesus then explained a specific sequence of events leading to a nightmare scenario that He called “great tribulation, such as was not since the beginning of the world to this time, no, nor ever shall be” (verse 21). This is not just a war or a rumor of a war. This is a catastrophic world war on a scale that human beings have never before experienced! The two worst wars in history occurred during the 20th century. World War i caused more than 15 million deaths. World War ii caused more than 60 million deaths—and by its conclusion, the world had entered the age of weapons of mass destruction. The two atomic bombs that ended World War ii are weak compared to the weapons human beings have developed since. The most powerful bomb ever exploded was detonated in 1961 and was thousands of times more powerful than either of those explosions. Today, there are an estimated 10,000 nuclear warheads ready for launch, with accurate delivery systems that can reach around the world. There are thousands more chemical and biological weapons and billions if not trillions of pounds of conventional ordnance and ammunition. Human beings now have the technical capacity—and the twisted mindsets—required to annihilate all human life. In the first century a.d., when the closest thing to a weapon of mass destruction was cyanide in a cistern or a torch thrown on a thatch roof, Jesus Christ prophesied that prior to His return, human beings would be capable of annihilating every last man, woman and child. That prophecy could never have been fulfilled in the age of the bow and arrow, or the musket and cannon, or the howitzer and tank, or even the airplane and aircraft carrier. Only in the last couple of generations have human beings possessed weapons of mass destruction that threaten to destroy all human life! And now, in the age of terrorism and nuclear-armed nations increasing in number, capacity and belligerence, the world faces increasing probability that these weapons will be unleashed. We are now living in a time like no other in history, when the next world war could cause the extinction of humanity. 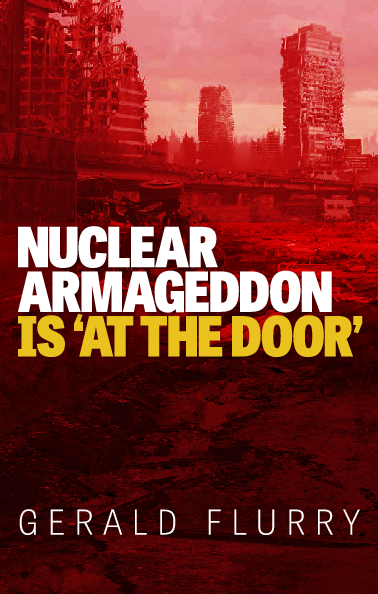 Learn more about this prophecy by requesting Nuclear Armageddon Is ‘At the Door,’ by Gerald Flurry. This was a sign from Jesus Christ Himself of His imminent return. And it has already happened. Herbert W. Armstrong presents his keynote book, Mystery of the Ages, to sophomore students at Ambassador College. Jesus gave another sign of His return, recorded in Matthew 17. Here, He was transfigured before three of His disciples. This was an incredible experience for them. They believed He was the Son of God, of course, but here was a dazzling vision that not only confirmed this but actually showed them what He will look like at His Second Coming. After seeing an advance vision of the most important event in human history, what did the disciples immediately think of? An intriguing question formed in their minds. After the transfiguration, the first question they asked Jesus was: “Why then do the scribes say that Elijah must come first?” (Matthew 17:10; New King James Version). They were referring to a specific Old Testament prophecy, recorded in Malachi 4:5: “Behold, I will send you Elijah the prophet before the coming of the great and dreadful day of the Lord.” Five hundred years earlier, God had prophesied that—before the dreadful cataclysms preceding Christ’s glorious return—He would send “Elijah the prophet,” or a man who would come in the power and spirit of Elijah, to prepare the way. The disciples regarded this as a powerful, pivotal prophecy. It was the first thing they thought of after seeing a vision of Jesus Christ’s dazzling return! “Elias [Elijah] truly shall first come, and restore all things” (Matthew 17:11). “Elijah truly shall first come.” Yes, what Malachi prophesied is true. Yes, his prophecy applies to my future return, which you just saw in a vision. Not only that, but this man, the Elijah who will come in the end time, will restore all things. Jesus gave the disciples an additional identifier—recorded and preserved in the Bible—regarding this Elijah-type individual: He would “restore all things.” When Jesus Christ returns, He will restore all things to the whole world (Acts 3:19-21). Yet He Himself said that this “Elijah” would restore all things. How would that be possible? Because God would use this individual to restore all things, the truth of the Bible, to God’s Church. Herbert W. Armstrong presents The World Tomorrow television broadcast. In Matthew 24, Jesus Christ gave more signs of what would occur before His return. Among these descriptions, one statement flashes like a lightning bolt: “And this gospel of the kingdom shall be preached in all the world for a witness unto all nations; and then shall the end come” (verse 14). The word gospel is used to refer to the record of Jesus Christ’s life in the biblical books of Matthew, Mark, Luke and John. But its main meaning is the message of Jesus Christ. The gospel message preached by billions of Catholics, Protestants and others over the centuries has been a gospel about Christ. It has been a message proclaiming that Jesus Christ was the Son of God and died to pay for the sins of humanity. But this is not the gospel Jesus Christ preached, and it is not the gospel He said would signal His return! Jesus Christ was the Son of God and did die to pay the death penalty for human sin, but that is not His gospel message. The gospel message He Himself preached is the gospel of the coming Kingdom of God! That establishment of God’s rule over mankind will revolutionize the world and the universe (Mark 1:14-15; Matthew 9:35; Luke 4:43; 9:1-2, etc). Jesus Christ’s Church has endured over the 2,000 years since His first coming—as He promised it would (Matthew 16:18). But it has not become a nation- and empire-dominating religious force of millions of people blending in the doctrines of many belief systems. It has not become a fractured coalition of thousands of independent churches with differing beliefs. It has been small and persecuted. And it had not preached the gospel of the Kingdom of God in all the world for a witness to all nations. But in the 20th century, a time of increasing dangers and weapons of mass destruction, God used an end-time Elijah to restore all things—including the gospel message of the Kingdom of God. That man preached the same gospel that Jesus Christ preached—and did so “in all the world for a witness” for the first time in almost 2,000 years! Herbert W. Armstrong preached that message to tens of thousands of members of the Worldwide Church of God, to millions of World Tomorrow radio listeners and television viewers, and to millions of Plain Truth readers. He also traveled extensively to deliver his message personally—and not only to everyday people and those in poverty in various countries. Mr. Armstrong personally met more than 500 heads of state, heads of government and other world leaders. Those he met included Britain’s Prince Charles and Prime Minister Margaret Thatcher, King Leopold iii of Belgium, First Lady of the United States Nancy Reagan, King Juan Carlos i of Spain, Chinese Premier Deng Xiaoping, Ethiopian Emperor Haile Selassie, King Hussein of Jordan, Egyptian presidents Anwar Sadat and Hosni Mubarak, Otto von Habsburg, Bavarian Premier Franz Josef Strauss, the emperor, crown prince and seven successive prime ministers of Japan, and six prime ministers and three presidents of Israel. He also met the presidents, prime ministers or kings of Argentina, Bangladesh, Chile, Costa Rica, Guatemala, India, Indonesia, Kenya, Lebanon, Mexico, Nepal, the Netherlands, Panama, Peru, the Philippines, Romania, South Africa, South Korea, Spain, Sri Lanka, Thailand and Vietnam, as well as dozens of ambassadors, plus numerous cabinet ministers, legislators, governors, mayors, generals, judges and other representatives, as well as chief executives, college presidents, musicians, artists, athletes, Nobel Prize winners and other leaders of industry and culture. Many of these leaders met him privately in their offices, conversed with him several times and invited him to speak to other important individuals. Some of these meetings were covered by national news media. Other leaders he met at banquets or formal meetings in which he was frequently the guest of honor and keynote speaker. Some legislators, mayors, professors, princesses and kings accompanied him on the corporate jet he used to convene with other world leaders or to visit Ambassador College, where some of them enrolled their children. Some of these leaders referred to Mr. Armstrong as an “ambassador without portfolio” whose commission was world peace. You can prove from your own Bible what is that true “gospel of the kingdom of God” that Jesus Christ emphasized in Matthew 24:14. 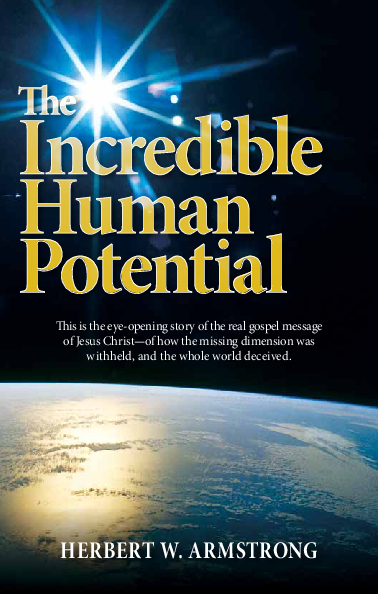 Mr. Armstrong wrote an entire book about it, called The Incredible Human Potential. As with all our other literature, we will gladly send you a free copy. The existence of weapons threatening all human life, the coming of a man to restore all things, and the preaching of the true gospel around the world are all signs that Jesus Christ Himself said would immediately precede His return. And all three of these signs have occurred. The existence of weapons that can annihilate humanity is a sign Jesus gave that everyone in the world can see. The sign of an end-time Elijah and the sign of the true gospel being preached around the world are signs that require you to focus on God’s Church. “Let no man deceive you by any means: for that day shall not come, except there come a falling away first, and that man of sin be revealed, the son of perdition; Who opposeth and exalteth himself above all that is called God, or that is worshipped; so that he as God sitteth in the temple of God, shewing himself that he is God” (verses 3-4). What a remarkable and troubling sign of Christ’s imminent return! Writing to true Christians, Paul said that inside the New Testament “temple”—the Church (e.g., Ephesians 2:19-22)—an extremely wicked leader would rise up, and there would be a great falling away: many true Christians forsaking God! 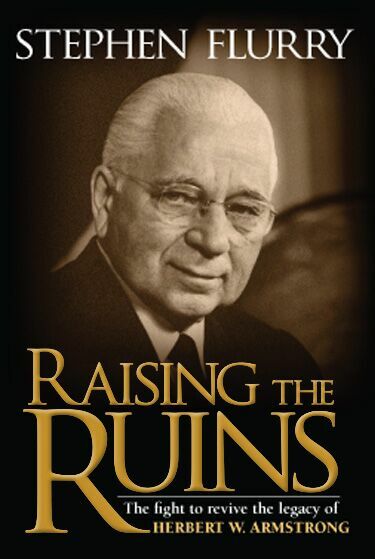 As discussed, God used Herbert W. Armstrong to restore foundational truths to His true Church. God used him to preach the gospel to all nations as a witness. And after Mr. Armstrong died in 1986, new leadership took over. These leaders deliberately rejected the doctrines Mr. Armstrong had restored, one after another, and subtly but progressively transformed the Church into a Protestant group. They stopped printing books and booklets authored by Mr. Armstrong, shut down the Church’s broadcast programs, and ended its educational and cultural projects. They even sold off its assets. This was led by one man in particular who used oppressive and deceitful methods to influence ministers and members. This was the “falling away” prophesied by the Apostle Paul! And it has happened! Despite the falling away that Paul spoke of, the work of God did not stop. This shocking history is recorded in our book Raising the Ruins, by Trumpet executive editor Stephen Flurry. And the biblical, prophetic history of this prophesied “great falling away” is revealed in Malachi’s Message, the founding book of this organization, authored by Trumpet editor in chief Gerald Flurry. Despite the falling away that Paul spoke of, the work of God did not stop. Gerald Flurry founded the Philadelphia Church of God to continue to teach the doctrines Mr. Armstrong had restored. The pcg reprinted Mr. Armstrong’s most important books, including Mystery of the Ages. The Worldwide Church of God sued the pcg for the express purpose of suppressing Mr. Armstrong’s teachings. During the ensuing six-year copyright lawsuit, the pcg fought to continue Mr. Armstrong’s legacy. Raising the Ruins is based on a trove of documents, including private memos, obtained during the discovery process of the copyright litigation. And the book also tells the story of how this work is reviving Mr. Armstrong’s legacy. And so is the greatest event ever to occur in the universe. Matthew 24 was Christ’s most pivotal prophecy when He was on this Earth. So why do Christians of this world fail to understand it? This is the eye-opening story of the real gospel message of Jesus Christ—of how the missing dimension was withheld, and the whole world deceived. It’s positively astounding! It has remained undiscovered by science! No religion has revealed it! Higher education has never taught it! Is it possible the whole world has been deceived—regarding the awesome purpose of human life—about the way to world peace and how it will come? And could it be true that the real gospel message Christ brought from heaven revealed this missing dimension—but was suppressed? This is the eye-opening story of the real gospel message of Jesus Christ—of how this missing dimension was withheld, and the whole world deceived.